Block Story Preview – A great recipe that needs more time to cook. Take the voxel world of Minecraft, fill it with goblins, a variety of dragons, sharks, and tons of other things to kill, and add a quest system to keep things flowing along, and you’ll have Block Story by MindBlocks Studio, LLC. I played about 5 hours of the Early Access version of the game which is currently available on Steam for $9.99, and experienced a game with an incredible amount of potential, but a severe lack of polish. Anyone that has played Minecraft or any one of its clones will know exactly what to expect from the opening moments of Block Story, right down to the immediate need to punch a tree only seconds after the game begins. Sure enough, a few punches later, a perfect block of wood is placed into the player’s inventory, ready to be split into planks and sticks, turned into a crafting table that allows more complex creations, and so on. Meanwhile, the remainder of the tree remains impossibly suspended in midair above where the punching occurred. Gravity is of no importance to the trees of Minecraft and Block Story, but it is quite important to the player’s character, which will die from falling only a few blocks down a mountainside, despite having the magical ability to hover and even rise into the air at will. Odder still is that the water of Block Story is equally unaffected by the planet’s pull. In fact, it is not unusual to see the entrance to a cave under water, and upon swimming down to enter the completely dry cave you can look up and see the ocean or lake water directly above you. And don’t get me started about the islands in the sky. In a world that made sense, this cave would be flooded. Realism has never been incredibly important to the genre, but it just feels like the design decisions that went into Minecraft, such as the presence of flowing water and lava, resulted in a much more believable game, where we would not have to suspend our disbelief quite as often as we must in Block Story. Even something as simple as the spawning of monsters and animals in the game world was handled with such subtlety in Minecraft, so that regardless of whether or not you understand the mechanics working behind the scenes, you still believe the circumstances of their appearance. When you see a chicken in a grassy field, it makes sense. When you encounter a zombie wandering through a cave, it is not unusual. But in Block Story, monsters, animals and even NPC quest givers are all bound by blocks that spawn them. If you destroy the block, they stop spawning, and if you place it back into the game world, the spawning resumes. I suppose it is handy in one sense, as this makes designing mob farms and cities exceptionally easy, but on the other hand, it gives the player far too much control over the world around them, and eliminates the randomness that can make even the most familiar landscape feel threatening. 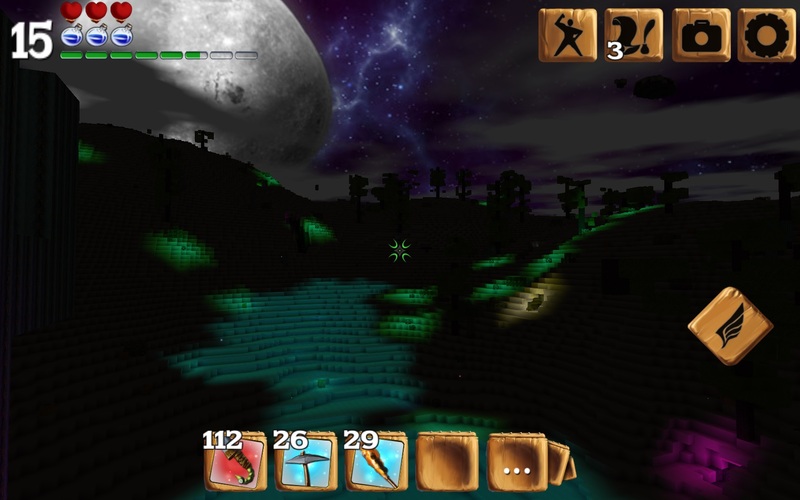 Instead of engaging a monster upon encountering it, the player is more likely to look around for the spawning block and disable it prior to picking a fight, or else they will have to fight an endless stream of monsters as they stealthily pop into existence very nearby—often right behind the player. I feel like this entire system is flawed, and makes the entire game world feel more like a toy box than a planet to explore. On the other hand, I do like how Block Story looks, mainly because of the glowing affect that the various ores throughout the game give off. Each block worth mining, whether it’s coal, iron, gold, or any of the others, gives off a colorful glow. This not only makes ores and gems easy to find, but makes the entire landscape come to life, especially at night, which is otherwise pitch black. On the other hand, the gems and ores are so commonly placed that they never seem rare. In the (admittedly short) amount of time I spent with the game, I never felt like I had found a special item. I spent plenty of time mining away at everything that glowed in sight, but the result was a full inventory of stuff I had little use for so early in the game. The “rare” earths aren’t all that rare in Block Story. I perused the lists of crafting recipes, and quickly prioritized making storage chests to put things in, and plopped them on top of a hill alongside all of the NPC spawning blocks I had collected. I debated building a house up there, but decided there was no need, since I had disabled all the nearby monster spawning blocks. I filled up the chests with every random item I had found, and there were quite a lot of them, and then began focusing on the feature that makes Block Story unique: the quests. This, perhaps, was the biggest disappointment of all. The quests consisted of a page or two of poorly written dialogue, and an assignment to kill a certain number of specific mobs, or to collect a huge shopping list of items. In almost every case, this left me at a complete loss for where to find what I was supposed to be looking for, and even when I knew exactly how to get what I needed, I felt that the sheer quantity of items required was far beyond reasonable. So I chose to try out a quest to kill a bunch of monsters that supposedly lived in a snowy biome and spawned at night. I found a snowy biome and looked around, but couldn’t find a single monster. Eventually I went on a massive journey, far away from my little hill, and I found another snow biome, but it was inhabited by high level dragons that could one-shot me, and scary ice elementals, polar bears, and other threats I was not prepared for. Baffled by why on earth such a quest was assigned to me so early in the game, I gave up on it and focused on another. Kill 20 sharks. Okay. That sounds reasonable for an adventurer capable of punching blocks of wood out of trees. I journeyed to the nearby shores of the ocean and jumped in. I was surrounded by all sorts of interesting marine life, like clown fish, sea urchins and even a dolphin! But there were no sharks. I swam towards the horizon, and after some searching I found them! Lots of them! And so I equipped my recently crafted sword, dived underwater and attacked! Two seconds later I was allowed to attack again! After sixteen seconds I had swung eight times, each swing subtracting from the durability of the weapon, and the shark eventually died. With one down and 19 to go, I was feeling pretty confident! I spawned at my little hill, where I had crafted a bed, and charged off towards the ocean on the horizon. Then I fell to my death. It sure looks pretty. I just wish I could stop falling to my death. After spawning again, I looked around at the colorful landscape and sighed. I wasn’t having fun. I was frustrated by the slow pace of combat, disillusioned by the perplexing physics of the game world, and bored by the slow rate at which my character was building strength as I gathered experience by mining and fighting. I decided it was time to do something drastic. I was going to journey as deep into the closest cavern as I could manage and see if that Minecraft-like sense of exploration and adventure would rush over me as I explored the depths of Block Story. 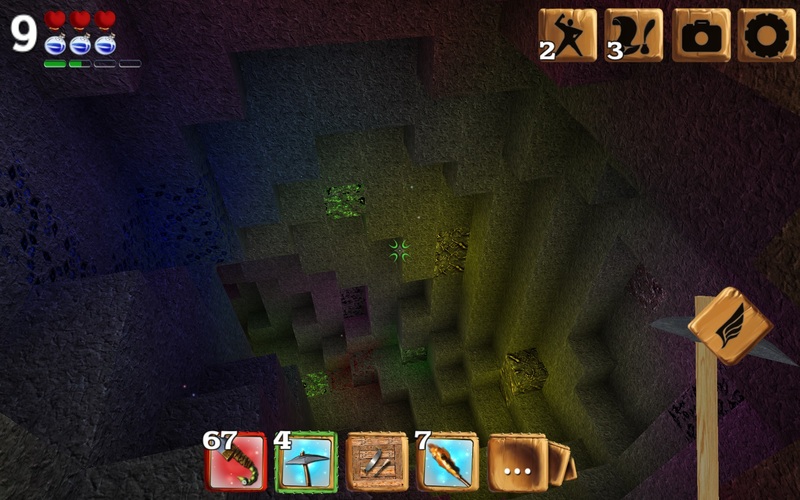 I found a suitably unfathomably deep chasm and carefully made my way underground. For the depths of the earth, it sure was bright and colorful. 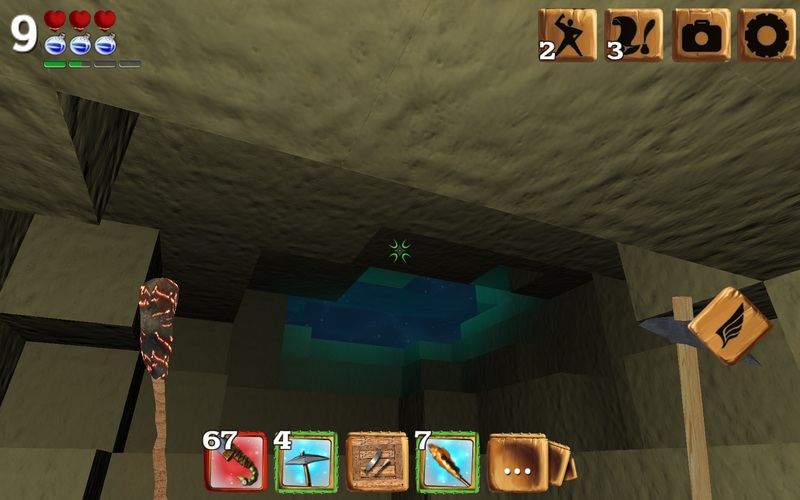 There were rare moments of darkness, but for the most part, the entire journey was illuminated by a variety of ores and gems, littered alongside the walls, and I rarely had need of the stack of torches I had prepared for such a journey. 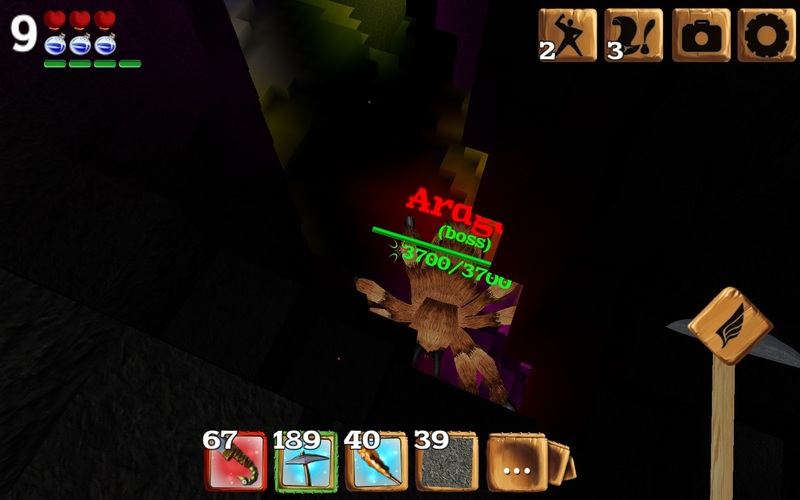 Deeper and deeper I traveled, occasionally destroying spider webs to stop spiders from spawning, or pulling apart other monster spawning blocks, but having an otherwise uneventful trip. Then, without warning, music started blaring out of my speakers at a volume significantly louder than anything else I had heard in the game beforehand. Swearing, I turned down the volume and tried to find the source of the excitement. It sounded like a boss battle! But I couldn’t find the boss. I traveled deeper. The music stopped. I went back up a few blocks. It started again. But there was no boss in sight. Exasperated, I continued my journey, growing ever more annoyed as the boss music would suddenly pop on and then turn off, over and over again. Some uneventful time later, I found myself extremely far underground—far deeper than the bedrock from Minecraft. Much to my surprise, I discovered a subterranean network of wide open caves filled with friendly goblins and not so friendly enemies. I was clearly under leveled, but I continued exploring, dodging enemies and waving at goblins until I finally took a wrong step and fell to my death, yet again. I got a brief look at this monstrosity before stumbling over the edge. I have to admit, I was actually impressed by the scope and scale of the game world, and by the large variety of mobs that inhabit the endless landscapes of Block Story. So I went down another cave, and this time, when the boss music started to play—startling me yet again—I saw it: a giant spider boss! I even managed to snap a screenshot before I fell to my death without ever taking a stab at it, or waiting 2 seconds to take another stab at it. I did see it had 3700 hit points though, so I would have had to stab it about 185 times, plus a bit more since the mobs recover over time. Of course, I only had 67 swings left in my sword. Oh well. It’s probably for the best that I’m such a clumsy explorer. Still, finding that boss spider and the dragons in the snowy biome gave me a good idea of what awaits those players who do choose to spend the hours necessary to build up the strength of their character. And Block Story is enough like Minecraft that many of the things that make Minecraft great are inherently present in Block Story, such as the Lego-like building potential. But after 5 hours of playing the game, I felt that the time investment required to level up and complete quests was too great when the script was so simple, the world was so difficult to believe in, and the gameplay was so rough around the edges. There is a great deal of potential in Block Story, and I love the idea of a voxel sandbox game with lots of RPG elements thrown in, but this one still needs a lot of polish, and for now, I’d rather just play more Minecraft. Hopefully somewhere down the road Block Story will succeed in realizing its ambitions.